Shipping on ALL ORDERS UP TO $59.99 PAY A FLAT $5.00 and ALL ORDERS OVER $60 receive FREE SHIPPING! Lather-rich handcrafted soap made with pure and organic essential oils, shea butter and/or moisturizing farm-fresh raw goat milk, and other natural ingredients that will nourish your skin and awaken your senses! Our soaps are made from scratch the old-fashioned way and are uniquely molded into a round shape so it won't slip out of your hands. Our incredible, original recipe creates explosive lather and just might make you want to wash your hands again and again! We strongly recommend resting your soap in a well-ventilated dish (one with several slats or holes to drain) to help it last longer. We're confident that you will find our soap lasts a VERY long time and is economically priced - is very easy for children to handle! Each bar is hand-cut to approximately 4 oz. before curing. And all of our soaps now arrive beautifully gift-wrapped (in 100% recycled paper) and sealed for giving or displaying. We are proud to say that our soap packaging is very earth-friendly. Our handmade soap is beautifully wrapped in biodegradable, 100% recycled paper, which has little impact on the environment and is completely breathable. This allows our soap to continue aging gracefully so you get the longest shelf life possible. At the same time, the wrap keeps the wonderful aroma of the soap from evaporating. 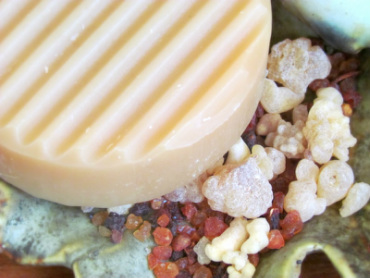 "I bought some soap for my mom for Christmas and it has cleared up her eczema completely. She was breaking out terribly and on prescription medicine, and by using your soap it's cured it."